BOSTON — Jennifer A. Lewis, Sc.D., an internationally recognized leader in the fields of 3D printing and biomimetic materials, has been appointed as the first Hansjörg Wyss Professor of Biologically Inspired Engineering at the Harvard School of Engineering and Applied Sciences (SEAS), and a Core Faculty Member of the Wyss Institute for Biologically Inspired Engineering at Harvard University. Lewis is the first senior faculty to occupy a Wyss-endowed professorial chair. 3D printing — also known as additive manufacturing — is the process of fabricating three-dimensional solid objects from digital computer models. Following computer-generated drawings, 3D printers generally deposit successive layers of various materials to build a physical object from the bottom up. The technique is used in a range of fields, from producing crowns in a dental lab to rapid prototyping of aerospace, automotive, and consumer goods. Jennifer Lewis manipulates various gels, polymers, and colloidal suspensions to create architectures that mimic those found in nature. Lewis’ research, however, has expanded 3D printing to a far more sophisticated level. By designing novel inks from diverse classes of materials, as well as high precision 3D printing platforms with exceedingly small nozzles, her research group is able to create very finely tailored structures with precise electronic, optical, mechanical, and chemical properties. “Our approach is distinct from commercially available 3D printers because of its materials flexibility, precision, and high throughput,” Lewis said. Lewis’ deep understanding of the chemistry and physics of soft materials enables her to design and manipulate various gels, polymers, and colloidal suspensions and create architectures that mimic those found in nature — such as bone, spider webs, or vascular networks. 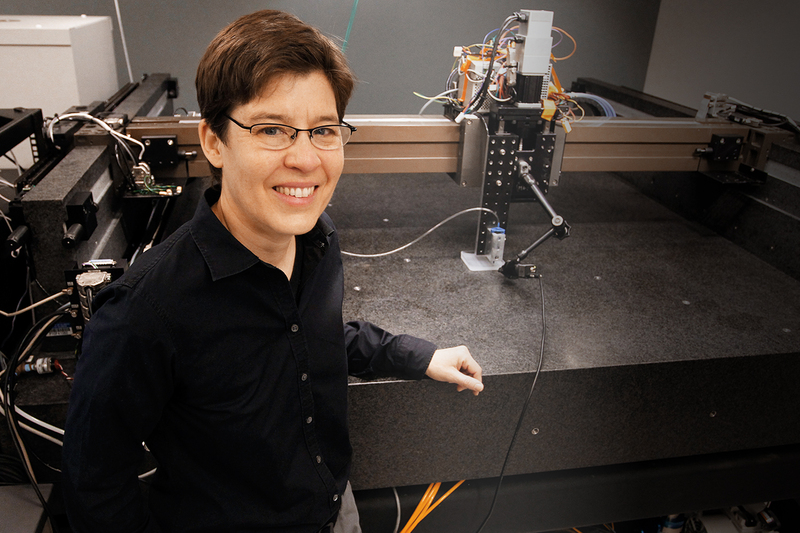 Her unique prototyping platform can pattern a broad array of functional materials under ambient conditions with features as tiny as one micron (less than one 25,000th of an inch) over areas as large as the top of a square coffee table, all in a matter of minutes. Once deposited, the inks solidify very rapidly, enabling the creation of intricate spanning and self-supporting structures, even at a microscopic scale. 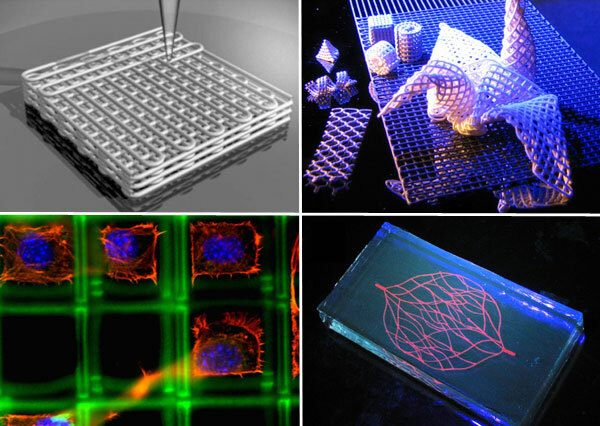 The potential uses for this technique in the near term are broad and include printed electronics, 3D polymer scaffolds for tissue engineering, and advanced materials for energy harvesting and storage. Prior to her appointment at Harvard, Lewis was the Hans Thurnauer Professor of Materials Science and Engineering and Director of the Frederick Seitz Materials Research Laboratory at the University of Illinois at Urbana-Champaign (UIUC), where she started her career in 1990. She has received numerous honors for her work, including the NSF Presidential Faculty Fellow Award, the Brunauer Award from the American Ceramic Society, the Langmuir Lecture Award from the American Chemical Society and the Materials Research Society Medal. She is a Fellow of the American Ceramic Society, the American Physical Society, the Materials Research Society, and the American Academy of Arts and Sciences. She serves on the Editorial Advisory Boards of Advanced Functional Materials and Soft Matter, in addition to authoring 120 papers and eight patents. Lewis also has a passion for Science, Technology, Engineering, and Mathematics (STEM) education and outreach, and has been active in this for two decades. Lewis’ new laboratory at Harvard integrates multiple platforms for materials synthesis, assembly, and characterization, as well as a design studio that will foster a pervasive culture of creativity and collaboration. The endowed chairs were established in 2008 by Hansjörg Wyss, MBA, as part of his gift to Harvard to launch the Wyss Institute for Biologically Inspired Engineering at Harvard University. Each chair recognizes a distinguished scholar whose research expands knowledge in areas related to the mission of the Institute: “to create biologically inspired materials and devices to advance human health and improve the environment, thereby revolutionizing clinical medicine and creating a more sustainable world.” Jennifer Lewis’ appointment at Harvard University officially began on January 1, 2013. Harvard School of Engineering and Applied Sciences (SEAS) serves as the connector and integrator of Harvard’s teaching and research efforts in engineering, applied sciences, and technology. Through collaboration with researchers from all parts of Harvard, other universities, and corporate and foundational partners, we bring discovery and innovation directly to bear on improving human life and society. Alumni of note include: Steve Ballmer, A.B. ’77, co-founder and current CEO of Microsoft Corporation; Leo Beranek, Ph.D. (S.D.) ’40, HBS A.M.P. ’65, former President of BBN Technologies, National Medal of Science winner; Tony Hsieh, A.B. ’95, founder of online shoe seller Zappos.com; and Bob Metcalfe, Ph.D. ’73, University of Texas Austin, Polaris Partners, National Medal of Technology winner, co-inventor of the Ethernet. For more information, visit: http://seas.harvard.edu. The Wyss Institute for Biologically Inspired Engineering at Harvard University uses nature’s design principles to develop bioinspired materials and devices that will transform medicine and create a more sustainable world. Working as an alliance among Harvard’s schools of Medicine, Engineering, and Arts & Sciences, and in partnership with Beth Israel Deaconess Medical Center, Brigham and Women’s Hospital, Boston Children’s Hospital, Dana Farber Cancer Institute, Massachusetts General Hospital, the University of Massachusetts Medical School, Spaulding Rehabilitation Hospital, Boston University, and Tufts University, the Institute crosses disciplinary and institutional barriers to engage in high-risk research that leads to transformative technological breakthroughs. By emulating nature’s principles for self-organizing and self-regulating, Wyss researchers are developing innovative new engineering solutions for health care, energy, architecture, robotics, and manufacturing. These technologies are translated into commercial products and therapies through collaborations with clinical investigators, corporate alliances, and new start-ups. The Wyss Institute was recently awarded the prestigious World Technology Network award for innovation in biotechnology. For more information, visit: http://wyss.harvard.edu.